Clear your head and take in the quiet strength of the Lotus garden. It takes skillful care and nurturing to grow these flowers to their full potential, but once picked, they provide their owner with wisdom. Beware, for there are others who will do anything they can to get their hands on these mystical flowers. You'll need to enlist the help of creatures native to this land to take control of the Lotus garden and achieve true enlightenment. The Lotus Garden has preserved its secret for centuries, but you have discovered the truth. The mystical flowers grown here will provide eternal life and everlasting wisdom to those who possess them. You must help the flowers grow to their full potential and pick them from the garden to harness their energy. Others are finding their way to the Lotus Garden and want these flowers for themselves. 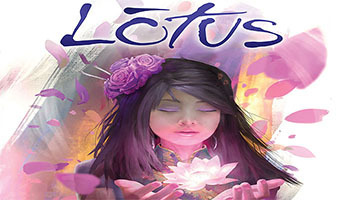 Partner up for a team version of Lotus, designed for 4 players. Complete the game Setup as outlined on page 3, with each individual player choosing his own color of Guardians. Choose partners and make sure players know which color of Guardians their partner is playing with. Partners should sit across from each other so that teams will alternate turns.